We’re getting ready to bring a baby girl in to this world basically at any moment now. We’re very excited…and of course there are still a billion things on my to-do list “before” she comes. Which is exactly the reason why my mantra the last 9 months has been, “Man plans, God laughs.” It will all happen the way it is supposed to! I’m writing today because I wanted to share something about my experience over the last 9 months (or is it technically 10 at this point??) that I hope will resonate with you – or at least give you a little laugh. When I was pregnant with my son – my first – almost 5 years ago…my pregnancy experience was in many ways about the physical experience. Though I believe I was the most mentally strong I’ve ever been in my life (for those of you who have gone through our 8-Week Body Project, you know my “I AM” story), the journey of seeing my body morph and change as I had never experienced was very real for me. I shared my experience in a blog post called, “I Hate my Body Today.” To date, not surprisingly, this is still one of my most-read posts…it really strikes a cord with women (pregnant or not). But this second go-round, expecting a child has been very different for me. Not consciously different though (as most experiences are). It’s been less of a physical journey for me (since I had a good idea of what to expect my body to do/not do during pregnancy) and instead, a very reflective and personal growth journey. There were several reasons why. In the course of the last 9 months, I’ve had 3 very close personal friends experience devastating miscarriages. We’ve had 4 women, members of our Body Project family, share with me that they’ve either experienced miscarriage, are going through intense fertility treatments, or are feeling defeated because they cannot conceive. This is ONLY in the past 9 months. Working with primarily women for the last 10 years, I’ve been confided in story-after-story about the challenges women have faced to have children. I waited until is was almost too obvious to announce that I was pregnant. 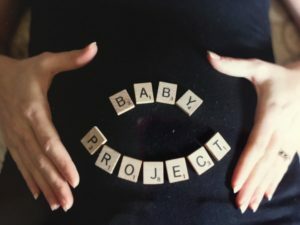 Part of the reason was because of my close friends who had experienced recent miscarriages gave me a sense of “cautious optimism.” Another reason is because I knew the moment I began telling people, the center of conversation would be about me. How I was feeling, how I looked, and how I would manage two kids, a business, training clients…etc. etc. etc. It may be hard to believe…but I actually have a very hard time with this kind of attention…more about why I feel this way in a moment. It was when I did “officially” announce that I was pregnant and the months that followed where I really found myself digging deep and figuring out why things that shouldn’t bother me…really did. And most of what was bothering me was from what other women would say to me. * All of the commentary I list below – I FULLY realize – generally comes from a place of genuine love and care. I know this. But I still had these very real feelings and reactions…that I couldn’t just ignore. *IF you are one of the special women in my life who maybe has said any of these things to me…please know that I realize you genuinely care about me and I do love you 🙂 I’m guessing the Home Depot checkout girl and woman in the dairy section of the grocery store probably aren’t reading this…but I’m sure they meant well too. Yes…thank you for noticing. Did you actually have to say it out loud? No woman – pregnant or not – wants to be told that she looks “bigger” or that she’s “popped.” One point lost in the self-esteem category! This is probably really silly and catty, because EVERYONE says it. But puppies are cute. My new little infant daughter will be cute. I’m closer to 40 than I am to 12…I’m not sure “cute” is the look I’ve been going for. So what CAN I do? Anyone else hate it when someone tells you what to do with your own body? Yep…that’s how I’ve felt. I am very in-tune with my body and use discretion as to what I can and can’t do. I’m pregnant, my body is actually made to do this. Tell my grandmother who had 8 kids over the course of 20+ years and who worked night and day on a farm to support her family that she should “take it easy.” A woman’s body is far stronger than we give it credit…when did we lose the sense of physical strength and stamina our bodies are meant for? My old body back? My body is doing something freaking amazing right now – it’s creating a human! The sad part is…I too often coach women who are so fearful of what pregnancy will do to their “post-baby” body that they lose the power of being present and enjoying the gift of pregnancy. And interestingly enough…I’ve seen time and again…the women who worry (ok, obsess) less about their body post-pregnancy, and focus on being healthy and caring for themselves usually “get their body back” quicker and without the life-long frustration. First of all…can I take it one baby at a time? Let’s just leave this very private conversation between me and my family. Too many women struggle to have just one child…one is a blessing. Hmmm. Thanks for wishing that on me. I think? I certainly can’t wait for my daughter to start with her sass and attitude! Because that’s what EVERYONE says will happen! Yahoo! “Lindsay, you look great! I was a HOUSE when I was pregnant! I kept trying to tell myself that these comments are pretty standard “things-to-say-to-a-pregnant-woman” and that the people telling me these things do mean well and just care about me. SO…why does it bother me so much? The last two comments (about fat bellies and houses, pork products and farm animals) – are the two comments I get that make me feel so viscerally upset. I’ve been thinking about it a lot (it’s part of what I do…I can’t help it)…women have the best intentions when they say these things to me – why would it make me so uncomfortable? I realized that even though the attention on my body was not very comfortable (ok…the attention on my belly…it’s always about the belly…), I’m fairly confident with how I feel in my own skin (and trust me, that has taken me a lot of work to feel this way). This “attention to my body” wasn’t the issue as I had originally thought it was. At the core of what I do – or at least hope to do – is help women shift the way they look at themselves, think about themselves and the way they speak to themselves. So when a woman would immediately counter a well-intended compliment with a self-defeating, self-insulting comment about herself or her own experience, not only did I feel like it negated the compliment, but it usually is a small glimpse in to the way she speaks to herself. IT SADDENS AND FRUSTRATES ME THAT SO MANY WOMEN SPEAK TO THEMSELVES IN A WAY THEY DON’T DESERVE. IN A WAY NO ONE DESERVES. Habits become the way we live our life. If we’re comparing ourselves to a house, meat product or farm animal (sorry guys…I just can’t help myself!) how does this reflect the internal thoughts of ourselves? How are these daily habits reflective in the way we’ve come to live our lives? Positive or negative? Most of us would never speak to our best friend, sister, daughter or mother the way we speak to ourselves. Are your thoughts leading you to positive actions and habits? Or are your thoughts self-sabotaging and self-limiting…contributing to the viscous cycle of frustration wherever it may exist in your life. Why is this perhaps more important to me now than it has ever been in the past for me? Maybe it’s because I’m bringing a little girl in to this world. There is nothing more I want for my daughter than for her to feel confident, worthy and empowered. I want her to feel this way not simply because she’s been told she “should” think this way. Not simply because she is a woman. Not simply because she looks or acts a certain way. Not simply because she has certain God-given talents. I want her to feel confident, worthy and empowered because it’s a driving force from within her and what she thinks, says and does will give her purpose and a sense of self. Empowerment and confidence is a path that starts within ourselves. No one will just give it to us – if we’re lucky we have people around us who will help show us the path…but we’ve got to believe in it, continue to walk it, stumble through it at times…and always get back up. So there you go…how a girl takes innocent pregnancy commentary and turns them in to a lesson in this precious thing we call life. Thank you for indulging your time with me as I share my story.